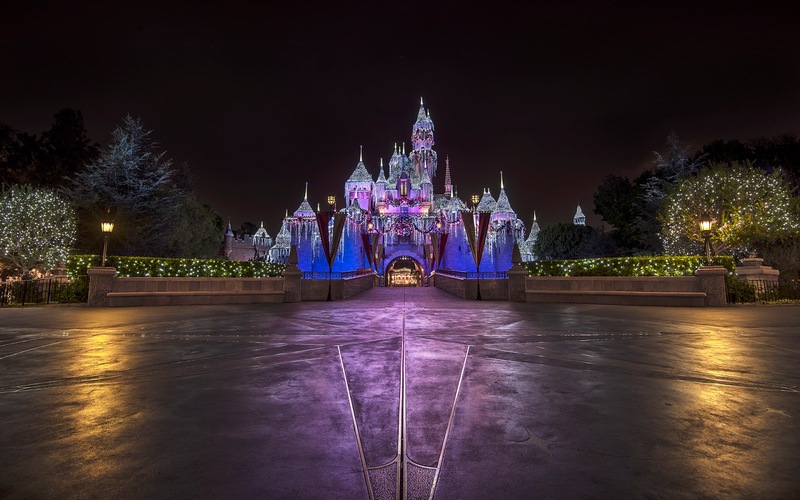 OK, so that doesn't quite rhyme, but this year's photo is a redo of the empty Sleeping Beauty Winter Castle photo I posted December 25, 2013. From time to time, I do like to attempt a shot again, because I feel that my photographic and editing skills and experience have improved enough to produce a significantly different shot. In this case, I do think there are several improvements, partly because I've also spent more effort on this year's--using six different exposures instead of last year's three. This has helped improve my control of the highlights (the bright parts such as the lamps and the spotlit parts of the castle) this year. You can actually see the pink in the castle. I've also dialed back the saturation and corrected the color a little better. The lighting around the castle is typically on the warm side, but I usually like pulling that back to balance things a little better. Looking back at last year's shot, I might have done that a little too much. An empty Sleeping Beauty Castle, lit up in snow. And it's truly empty here--a rare chance indeed! What do you think? Do you prefer this year's or last year's?